Tapered Roller Bearings withstand harsh environments. Suited for heavy-duty machinery industry, High Carbon Chromium Steel Tapered Roller Bearings are comprised of inner ring, outer ring, tapered rollers, and roller retainer. Through-hardened units feature consistent hardness throughout component, while case-hardened models have surface hardening combined with flexible core. Standard sizes range from 15-240 mm or .59-9.45 in. ID and 35-40 mm or 1.38-15.75 in. OD. September 2006- AST Bearings announces it has added a brand new product line of High Carbon Chromium Steel Tapered Roller Bearings to compliment its existing line of quality products. At a time where some major bearing manufacturer's are having trouble supplying Tapered Roller Bearings within reasonable delivery times, this is very good news for the heavy-duty machinery Industry. AST Bearings provides quality Tapered Roller Bearings with quick delivery times with a product that is completely interchangeable with those of major bearing manufacturers all at a cost-effective price. 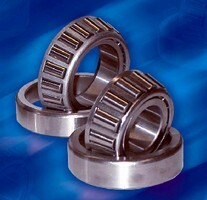 These bearings are comprised of four basic components: The cone (inner ring), the cup (outer ring), tapered rollers and a cage (roller retainer). The cone, cup and rollers carry the load while the cage spaces and retain the rollers on the cone. The cone, rollers and cage are referred to as the cone assembly. Individual cup and cone components are available as well as the complete assembly. Although Through-Hardened bearings have gradually become the preference in heavy-duty commercial trucking applications, AST Bearings will supply both Through-Hardened and Case-Hardened Tapered Roller Bearings. The difference is Through-Hardened has a consistent hardness throughout the component and Case-Hardened has a surface hardening combined with a tough, flexible core. Case Hardened will be supplied upon special request only. The advantages of these tough Tapered Roller Bearings is they offer Dimensional Stability under heavy loads, Long life performance in harsh and contaminated environments, a Durable Steel Cage and are Dimensionally Interchangeable with other major bearing manufacturers products. Tapered Roller Bearings are used for heavy-duty, moderate speed applications. Typical Applications that will benefit from these durable bearings is Agriculture, Construction and Mining equipment, Various Axle systems, Conveyance vehicles, Gear Box, Engine Motors, Reducers and more. A broad range of inch and metric sizes are available. The standard stock sizes are: ID 15-240mm or .59-9.45 inches to OD 35-40mm or 1.38-15.75 inches. Most standard industrial sizes are available in inch and metric. Custom sizes are also available upon special request. Please consult and AST sales specialist for larger sizes and availability.